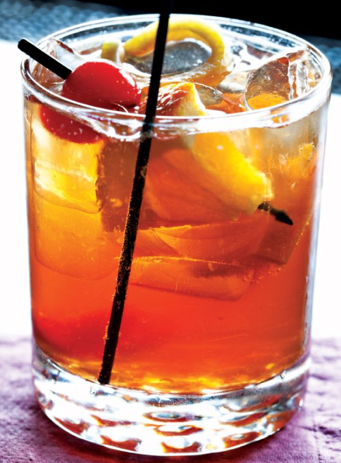 This is my father’s coveted Old Fashioned, served lovingly and on trays at the best of family celebrations. Each drink is made individually. 1. Put a sugar cubes into an old fashioned glass. 2. Shake the bitters over the sugar cubes so the bitters soak into the cubes. Then smash the sugar cubes and fill the glass with ice. 3. Pour over with 2½ shot of any whiskey or brandy (recommend Jack Daniels). 4. Add selzer to fill the glass ~ more whiskey than selzer. 5. Garnish with a slice of orange, a maraschino cherry and cinnamon stick. Bartenders at Kincaid’s, Minneapolis, prepared this Bloody Mary in the early 1990’s, advertising this recipe and a recipe for my favorite Marguerita (which can be found here as well) on small cards posted on tables throughout the bar. What makes this recipe different and better than a thousand other Bloody Mary cocktails is that it calls for beef broth and horseradish. Great for a cold, clear winter brunch or football gathering. Recommend that one serves this with a snoot (a small glass) of ice-cold beer.